It is said that we often know more than what we give ourselves credit for. The danger is not so much what we think we do know but what we think we know when we really don’t. Anyway, eight mothers who are a part of Bakers Beyond, were tasked to design a part of our premises that is to be repurposed as a workplace for baking and sewing activities. All came to the session wondering how they could actually take on the task without the necessary expertise. 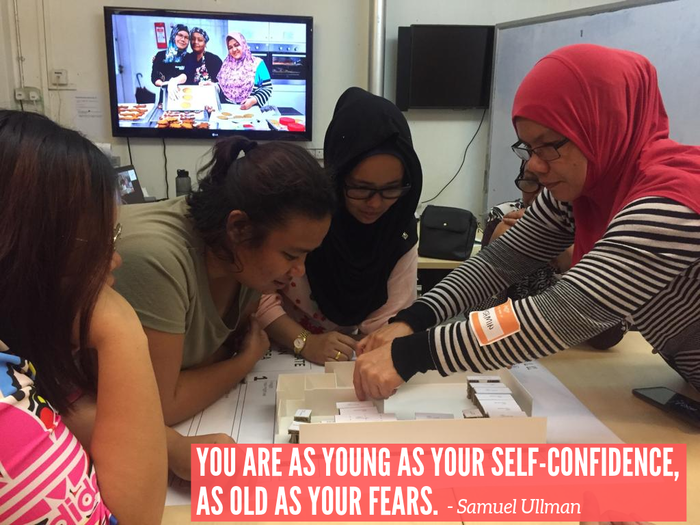 After greeting the mothers warmly, Raja a volunteer from the School of Design & Environment, Ngee Ann Polytechnic got the mothers to share information about themselves that was related to baking. “What’s your favourite cookie?” was one and when he got the answer, he asked them to elaborate why it was so. The conversation continued in the same vein and the mothers shared about the bakeries they liked, the celebrity chefs they followed on television, the cafes they admired and such. Each response was an important piece of information that was sorted onto billboards that were decorated with related pictures. The mothers had fun and soon caught on that Raja was gradually getting them to connect with their experiences and eliciting their preferences and opinions how a shared workplace could look like. So, when they were eventually asked what they wanted in a workplace and how it should look like, they had quite a good idea. To test the plausibility of their ideas, the mothers also got to shift the furniture on a model that was built to scale. Over the years, our efforts in promoting a healthy respect for work and the opportunities to do so, no matter how small have enriched our members’ quality of life. Not so much a quality measured by material gains or comfort but the quality of feeling alive; a sense of independence and the ability to care for others. It is work we aim to further develop, and we are looking forward to the designated workplace that our mothers have designed.